Have you ever been to a fine dining restaurant where they asked you to pay before you’ve had your meal? Of course you haven’t, because that would be inhospitable. (And not fun.) Yet nearly all form pages and preference centers start with extremely personal questions and hide the choices you care about toward the end of the experience. 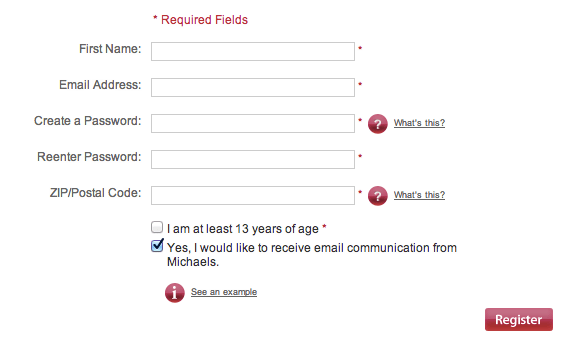 This is why most customers don’t complete online forms: tedium isn’t fun & tasty. Hobbies, however, are fun & tasty. For Michaels, the exciting section is placed first (“Tell us your interests”) so the customer gets instant satisfaction from curating their hobbies (and their data points). Only afterwards are they asked for basic information like “Name” and “Address”, but they are more likely to share it now that they understand its benefits. Self-segmenting their attributes (Teacher? Parent?) allows for more relevant and targeted emails.